BWARS members Stuart Roberts and Lizzy Peat have followed up reported sightings of the large and impressive bee genus Xylocopa over-wintering in Shepshed, Leicestershire. Following an internet forum report of Xylocopa-like bees over-wintering in a dead tree in a Shepshed garden, the householder concerned posted some photos of the bees, which confirmed there identity as Xylocopa species. Lizzy Peat also visited the garden and was able to confirm that Xylocopa are present. Stuart reports that "The householder has had up to EIGHT in his garden at one time (in 2006), and so I think we can state categorically that the species has bred here, and successfully over-wintered. I am sure this is a first." From close study of the photographs (and using a bit of computer enhancement), it looks certain that the species involved is Xylocopa violacea. What remains a mystery is how these bees came to be in Leicestershire, as the area is remote from any coastline. It is possible that the bees have been imported in timber and have gone on to establish in the area. In February I heard from a naturalist living on the west coast of Wales, at Borth, Cardigan, that she and her husband had seen two, or possibly three, very large shiny black bees last August on two consecutive days in their garden, coming to flowers of tree mallow and buddleia. These were almost certainly Xylocopa and the fact that there were two or three may indicate that they were breeding in the area. Then, a week later, news started appearing on the "Wild about Britain" website of Xylocopa nesting last summer in an old apple tree at Shepshed, north of Leicester, where at least eight individuals had been seen by Derick Walton, the owner of the garden. Photos of the nest holes in the apple tree appeared and news that there were about five individuals already flying around on warm days in February. At last photos were displayed of one of these bees on the apple tree and it is clearly a male X. violacea because the two segments near the end of the antennae are reddish. This antennal character in the male distinguishes it from its close relative X. valga, which has entirely black antennae and which is also found sporadically in the more northerly parts of Europe. Lizzy Peat, a committee member of BWARS, visited the site a few days later and saw five X. violacea around the apple tree. Shepshed is an odd place for a new bee to be found nesting as it is almost as far from the coast as any locality in England. Being on the M1, Shepshed has several large lorry parks and is only three miles from East Midlands Airport which caters for large amounts of freight, so it is possible that it was accidentally introduced here in wooden pallets from the continent. However, since it has now, apparently, successfully nested and overwintered here there seems to be no reason why it should not increase and spread all over England. X. violacea is, with X. valga, the largest solitary bee in Europe, similar in size to some of the largest bumblebee queens, and is a member of a subfamily of Anthophorinae. 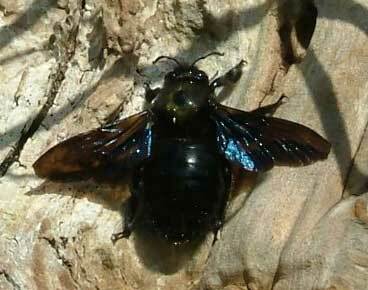 Most large carpenter bees in the genus Xylocopa, with over 730 species worldwide, most of them tropical and subtropical, excavate nest burrows in dead wood. There is also one British representative of the small carpenter bees in the genus Ceratina, another worldwide anthophorine genus with hundreds of species. This is the the very small, shiny blue Ceratina cyanea, uncommon and very localised in southern England, which excavates its nest burrows in dead pithy stems, mainly of bramble. Both British carpenter bees have similar life histories; at the end of the summer both sexes enter the the old nest burrows, where they overwinter, and the females may therefore live for more than a year. I would like to report a sighting of what we believe was Xylocopa violacea in Tattenhall ,Cheshire on the 14th of July 2007. My wife and I spotted a large black bee with a startling blue sheen on it's wings which stayed around the garden for 10 minutes or so. Unfortunatley we did not manage to photograph this specimen and have no voucher so it remains an anecdotal report. I had originally contacted David Kendall of Kendall Bioresearch to ask whether this species could have been present in Cheshire and he directed me to your website where I was amazed to see the same bee reported in Leicester. Anyway I thought you may be interested in our sighting even if we cant verify with a photo or voucher. We at least thoroughly enjoyed seeing such a strange and beautiful insect in our garden! In my previous report, in April, I mentioned the first successful breeding of the Violet Carpenter Bee Xylocopa violacea last summer in Leicestershire and noted that it was an odd place for a colonist to be nesting. I have now heard that this bee also bred successfully last year, also in an old apple tree in a garden, on the northern fringes of Tonbridge, Kent. It successfully overwintered and three were seen by the garden owners in March at rosemary flowers. Unfortunately the apple tree blew down in a gale in the spring but soon afterwards BWARS member Geoff Allen saw two or three specimens of this unmistakeable bee flying around the adjoining gardens in April, one of which was inspecting an overflow outlet pipe. He was unable to catch any to make a positive identification, in case it was the very similar species X. valga. Kent is of course a much more likely place than Leicestershire for a vagrant bee from the continent to start nesting. The new generation should have emerged at both sites in July. Strangely enough I have also heard that another Xylocopa was seen in early June, coming to flowers at a nursery about 20 miles north of the original nest site at Shepshed. This nursery imports plants from Italy and an adjoining company there imports timber from Eastern Europe so this specimen may well have been accidentally introduced. There is also the intriguing possibility that there is more than one nesting site in the East Midlands. This season has started with the exciting news that the very large and spectacular Violet Carpenter Bee Xylocopa violacea not only nested successfully in England last summer but has also overwintered. Almost certainly it also nested last summer in Sark, Channel Islands and possibly elsewhere. In October 2003 (BW 15:64) I predicted that, because of the recent increase in records of this vagrant species, it could well start breeding in this country. There had in fact already been a single record of a female nesting in a fence post at Kings Langley, Hertfordshire, as long ago as 1920, but unfortunately the post, with the nest, was removed before the end of the summer and sent to the Natural History Museum, London. Since 2003 there has been a steady trickle of records of singletons, mainly from the south-east, but last December I reported three records for 2006, two of which were from the north. There was also a fourth record last summer from Margate, Kent. Last year I learnt that the bee had been spreading northwards in Europe in recent years, especially in Germany but also in Normandy, France where it was now being found up the west coast of the Cherbourg peninsular, opposite Jersey. In June 2006 I found it even further north, about 25 miles from Cherbourg. In November, at the British Entomological and Naural History Society Annual Exhibition, Roger Long, who lives in Jersey, gave me a specimen of a male X. violacea which he had taken in the gardens of the Seigneurie on Sark in June. He and his wife Margaret had seen at least five of these bees flying around there on the same day which suggests that they were almost certainly breeding there. They had previously seen Xylocopa on three occasions at scattered sites in Jersey between 1979 and 1989. Although the Channel Islands are part of the United Kingdom, they are, of course, geographically not part of the British Isles, but of France. At least three Xylocopa were seen in a field in Rushden, Northamptonshire. Video footage of one of these bees can be watched here. Xylocopa was also reliably reported from Worcestershire during 2010.